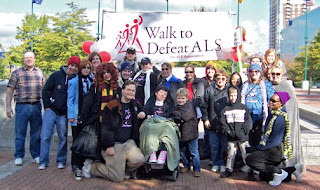 We just had a fantastic Labor Day weekend, with the ALS Association being chosen as the official charity of DragonCon 2012! The bean counters are still working to calculate all of the donations, and following right on its heels...The 2012 Walk to Defeat ALS is coming in October! The ALS Association is an important charity, because ALS (Lou Gehrig's Disease) is still considered an "Orphan Disease", meaning not enough people suffer from it to get major medical funding for treatment research. But promising new research is always on the horizon. This year, scientists showed that Stem Cell injections can heal spinal cord injuries in mice to the point that allows them to walk and run again! With continued funding and research, and a lot of hope, an effective treatment for ALS may be realized in the near future. (1) http://web.alsa.org/goto/flamingos2012 -- Join the Team, to raise funds and walk with us on October 20th, or just as a "Virtual Walker" if you can't make it. You'll get your own fund-raising web page with a tidy little link (like http://web.alsa.org/goto/fiver2012") and all the materials you will need.With email, blogs and Facebook, it takes very little effort to reach hundreds of people with your message. At Melissa's request, the Theme for this year is "Walk a Mile in My Chucks!" 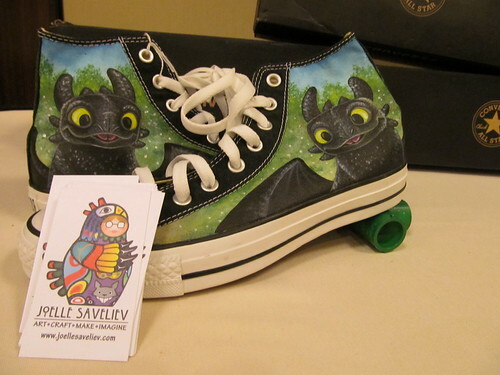 So everyone show up in a pair of Converse sneakers (Decorated or not), in honor of the great turnout for the "Chucks for Fiver" Art Project for the DragonCon Charity Auction. Please allow 10 business days for shipping. Otherwise, just wear a black shirt.